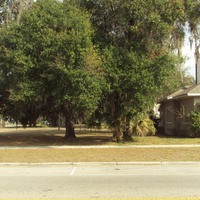 The lots located at 505-507 South Sanford Avenue in Georgetown, an historic African-American neighborhood in Sanford, Florida. The earliest known residents of Suite 505 were all African Americans: Washington Crittenden in 1911, Mack Dupree in 1917, and Griffin Clair in 1924. In 1926, Clair was listed next door at Suite 507. Annie Jones, an African-American woman, and N. H. Smoke, presumably white, were listed at Suite 505 that same year. The earliest known occupant of Suite 507 was Dr. Edward D. Strickland, a successful African-American dentist who practiced from this location in 1924. Dr. Strickland later moved his office to 300 1/2 S. Sanford Ave. from 1926 until 1946. In 1926, he also shared his office with Dr. O. A. Prince, another black physician. Dr. Strickland resided at 305 South Sanford Avenue in 1917 and moved to 511 South Sanford Avenue by 1926. After Dr. Strickland had relocated his office, Clair moved from Suite 505 to 507. In 1947, an African-American woman named Dozia Jones was listed at this address. At the time that this photograph was taken in January 2012, both lots were vacant with no buildings. "Pathways to History - Historic Georgetown" City of Sanford. http://www.sanfordfl.gov/index.aspx?page=483. African Americans; Clair, Griffin; Crittenden, Washington; dentists; doctors; Georgetown; Jones, Annie; Jones, Dozia; physicians; Rock, Adam; Sanford; Sanford Avenue; Smoke, N. H.; Strickland, Edward D.
Rock, Adam. “505-507 South Sanford Avenue.” RICHES of Central Florida accessed April 21, 2019, https://richesmi.cah.ucf.edu/omeka/items/show/3697.